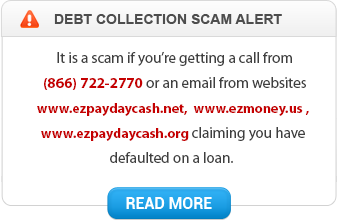 Thank You for visiting EZPayDayCash.com! We are committed to make your experience with us a totally enjoyable one. Our goal is to meet or exceed our customer’s expectations every time. We welcome your compliments, complaints or any suggestions you have to improve the way we do business. We look forward to hearing from you. Check our FAQ page for immediate answers to most common questions. Questions: If you have a question, please refer to our FAQ Frequently Asked Questions.